One of a series of Amtrak seasonal images by illustrator Nathan Davies. Although this summer was a little cooler than usual on the East Coast, it’s still hard to believe that autumn is upon us. 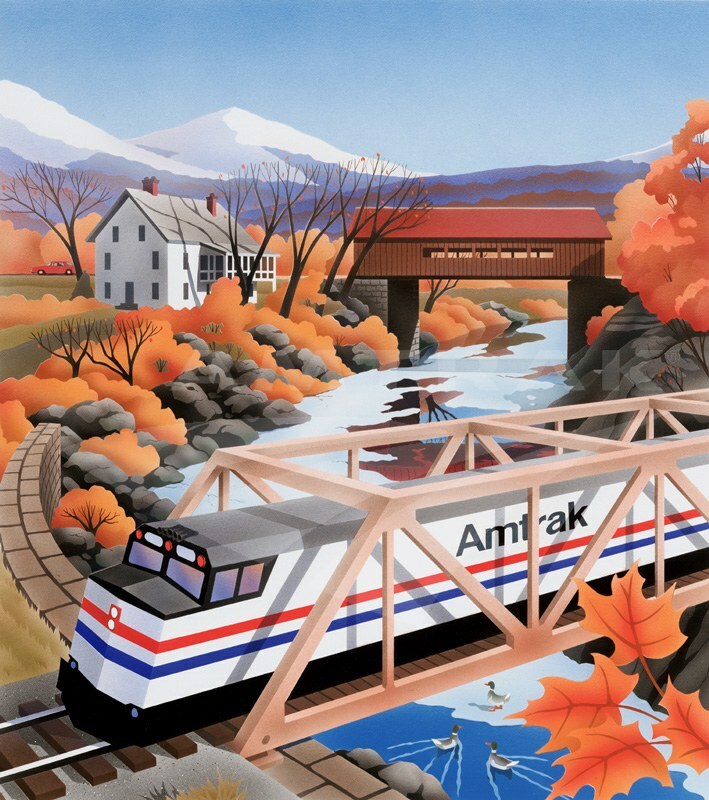 Whenever I think about the changing seasons, my mind turns to a collection of images produced for Amtrak in the late 1980s by illustrator Nathan Davies. Scenes include trains moving through rich farm fields, snowy mountains and along the shore, a lighthouse in the distance. One of Davies’ works (above), featured on the cover of the national system timetable released on October 28, 1990, shows a train crossing a small, partially frozen river. In the background is what most of us probably think of as an idyllic New England landscape with a picturesque covered bridge and sturdy white farmhouse nestled amid bare trees. Bright oranges and reds paint the river slopes, where migrating ducks rest before continuing south. 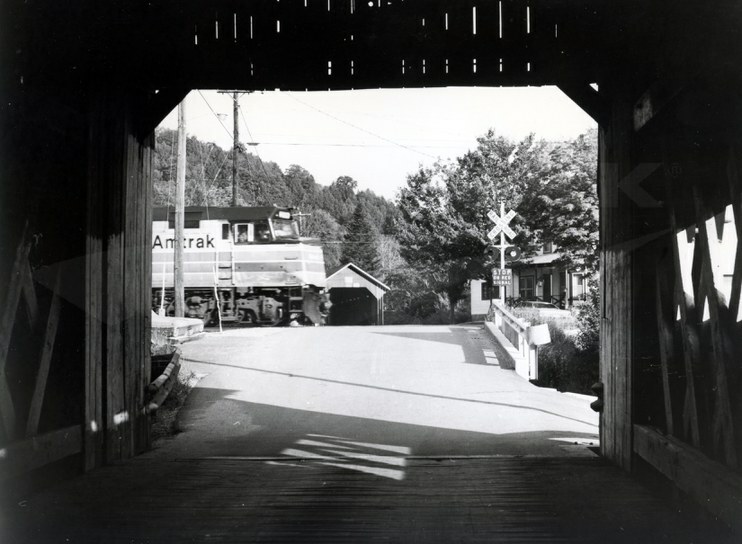 It’s reminiscent of the archival photograph below showing the overnight Montrealer (Washington-Montreal) through the portal of a covered bridge. Not only do you see the northbound train, but in the background is another covered bridge. When we found this photograph in a folder with other images, the location was a mystery. But thanks to the two bridges, we were able to figure out that it shows the train at Northfield Falls, Vt., which is between the Amtrak station stops at Randolph and Montpelier. The northbound Montrealer passing through Northfield Falls, Vt. The photographer stood on the Station Bridge that carries Cox Brook Road across the Dog River; built c. 1872, it features a 138 foot long Town Lattice truss. In the distance beyond the tracks is the Lower Covered Bridge, which dates to the same period. The 55 foot long queenpost truss structure carries the road over its namesake Cox Brook. To our advantage when trying to determine the location, this happens to be the only spot in Vermont where one historic covered bridge can be seen from another. The Vermonter passing through the countryside. As an international train, the Montrealer had a cosmopolitan flair resulting from the need to provide menus, announcements and other information in both English and French. It was also known among skiers since it provided easy access to numerous winter resorts. On April 1, 1995, it was replaced with the daytime Vermonter, which ends its northbound journey at St. Albans. Since its inception, the Vermonter has been financed primarily through funds made available by the Vermont Agency of Transportation. 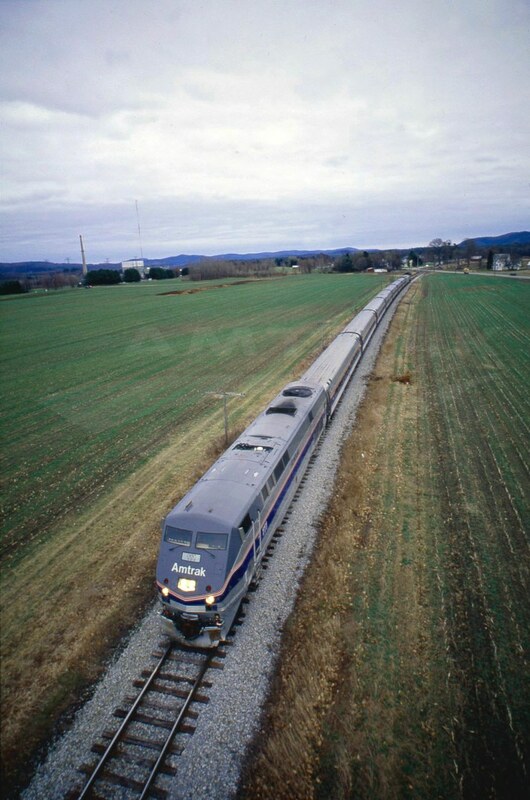 The state also provides financial support for the daily Ethan Allen Express between Rutland, Vt., and New York City. The Vermonter, much like the Adirondack (New York-Montreal) and Cardinal (New York-Chicago), is especially popular in the fall—the train is a perfect spot from which to admire the rich colors of the changing leaves. It passes through beautiful forested landscapes just east of Lake Champlain, through central Vermont and along the Connecticut River Valley. This year, passengers aboard the Adirondack can admire the foliage aboard the historic Amtrak Great Dome car. Built by the Budd Company in 1955 for the Great Northern Railway, it features upper level seating beneath the dome for all-around panoramic views. The car’s six-week run on the Adirondack lasts from September 25 through November 4, 2014. Check out this Amtrak press release for schedule details. Have you ever taken an Amtrak train to see the fall foliage? If so, which train? Share your story with us below.